Ford has added a reversing camera to the options list of Britain's best-selling car - the Fiesta. 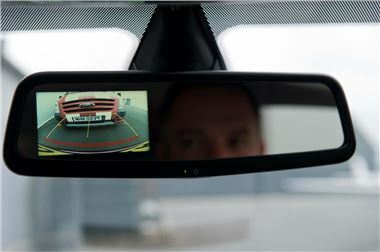 The reversing camera is mounted in the rear-view mirror cost £475 on all models from Edge to Titanium. When the new rear-view camera is selected as an option, the customer benefits from a list of additional convenience features: automatic windscreen wipers, automatic headlamps and rear parking sensors. Titanium drivers will also now have a Sony radio with CD player, USB and Bluetooth as standard. The Fiesta Titanium already lists many big-car features, including cruise control and automatic headlights.So far this year, 20 per cent of Fiesta customers have chosen to buy top-of-the-range Titanium models. Mark Simpson, Ford of Britain marketing director, said: "Fiesta has taken the top sales spot for small cars every month since the start of 2009. We know that whilst customers may choose a smaller car than before perhaps for economy reasons, they still want the technology and comfort features to make their Fiesta a premium choice. The Ford Fiesta continues to lead the UK sales charts with more than 87,000 sales so far in 2010.